Click on images to enlarge. 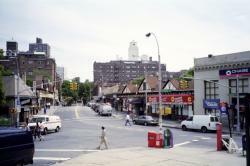 To view a Lefferts Boulevard slideshow, click here. Editor's Note: Please read the attached letter from City Council Woman Melinda Katz about a City Council Subcommittee Hearing to be held here to solicit comments about the proposed historical designation of the community. My name is Carol Binswanger Bowen, and I now live in Wichita, Kansas. I attended PS 99 in Kew Gardens, but moved to Kansas after the 7th grade. I was mid term, so would have graduated in January of 1943, I think. I lived at 118-80 Metropolitan Avenue. I wonder if PS 99 is still there? I found this site after much searching. My current name reads as Annie R. Cohen-Coles f/ka Annie R. Cohen. 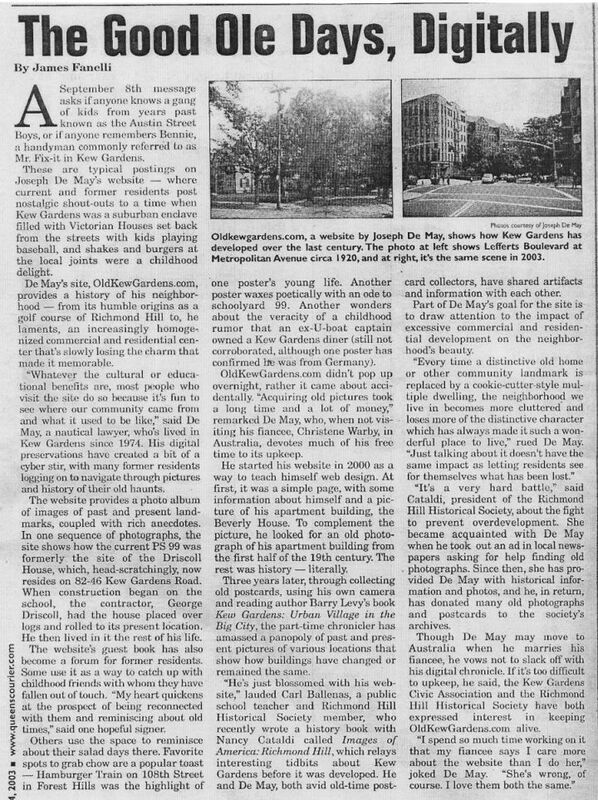 I lived in Kew Gardens at 118-40 Metropolitan Ave , Apt. # 3M If I remember, the building name was Alt Green Towers, between February 1972 (the day I was born) until I got married in March 1999. I did not attend P.S 99 but P.S 90, depending on what side of Metro. Ave you resided determined what school you went to. My best friend at the time, Patricia Calvo lived directly across the street and went to P.S. 99. Go figure. Upon reading your guestbook on a regular basis, I see the years referenced are constantly in the 30's through 60's. What about us youngsters? I remember Bernie Land, as clear as day. They were the only place that sold White Owl cigars for my dad and where I can sit on those spinning stools to the counter! 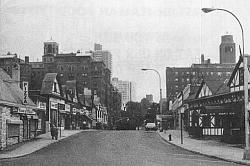 I remember the corner butcher, Lefferts & Metro. with "Cutie" that used to always give me free bologna slices at the side of the deli by the front door! I worked at the video store, "Pac-A-Flic" on Lefferts from the time I was 15 until 23 (on the weekends during college when I came home) with Carmine.. Dani's and Lydia's Pizza were the favorites for our generation. Oh, Homestead Deli has the best meatloaf w/ ketchup on rye! Please feel free to post my email address, I would love to hear from maybe the children of the guests that sign on from the 60's. I found the site by searching Kew Gardens, to show my co-workers here in Florida where I came from. In looking over you website I saw a posting from Marcia Balaban inquiring about Mr. Estrin's class at RHHS so I thought she and others might be interested in the email about a reunion of the class of 1956. Perhaps you could forward it on. For over 400 Richmond Hill High School graduates, the actual day of our fiftieth anniversary is fast approaching. Graduation day was June 27, 1956 and the place was at the Forest Park band shell and grove. Class President Carol Drescher Koenig and her committee are planning to celebrate this event during the weekend of *September 15-16, 2006*. I am happy to report that Carol nee Drescher Koenig, Jean nee Abernethy Wilson, and Pat nee Butz Dymek have agreed to work as a committee to organize local arrangements. I will continue to act as the liaison for communication. The list of participants has grown to about 40 interested classmates including some from Florida, Indiana, California, and Arizona. The little train that could is gathering steam and it has pulled away from the station destined for Richmond Hill, NY in September. We hope that you will reserve that weekend, and that you will scramble on board the reunion train. My emails regularly include a classmates who has heard from a friend that a 50^th reunion is being organized and they want to know more and want to be included. Please forward this email or by some other means contact your R.H.H.S. friends so that we can add their names to the growing list. Last year I said that if only one graduate would show up, there would be a reunion on September 15-16, 2006. Happily others have expressed interest in joining me, and this is clearly a case of the _more the merrier_. So what if some of us are heavier and grayer, that is not important. These hours of reunion will provide an opportunity to “catch up” on the lives of people with whom we shared four formative years before scattering. Perhaps after exchanging addresses and information, friendships might be rekindled. I think a reunion after 50 years of waiting is definitely in order. Please dig out your old 1956 Archway, shed a few pounds if you want to, find your old RHHS sweater (if the moths haven’t eaten it), and plan to join us. Of course, we will announce detailed plans for the weekend as they develop. For now, reserve the date, and most importantly, contact old classmates using address books and the internet resources, and forward addresses, email addresses, married names, and any contact information to me for inclusion on our master list. If you have ideas for the weekend, or if you wish to help in the arrangements, please contact me at Fred.Meyer@valpo.edu or 219-462-8912. Hearing from a long-lost classmate just makes my day! I hope to see you and your classmate friends in September. *P.S. I will be out of the country until April 10^th , but I will respond to emails when I return. Hello, I lived in Kew Gardens for 23 years in front of the Parc Chateu until I relocated to Oregon on August 10, 2004 to be with my significant other. Though, I am happy with my home life, I miss New York and can appreciate the beauty and architecture of Kew Gardens from 3,000 miles apart! I love the old pictures and new ones, gives one a glimpse of history. I am delighted I found this site while doing a google search, and have been sending pictures of Kew Gardens to my West Coast friends. Will be looking to see if I find pictures of Kew Gardens that I can share. brendan loughlin from 1958 to 1983 bar tender at ten downing street for a few years part of the loughlin clan there where 10 of us . g. fitz told me of the site so i thought i would say hello old k.g. I lived in Eton Hall from July 1968 to May 1979, when my then-husband and I bought a house on 115th Street between Myrtle and 85th Avenue, where I lived until 1998. My daughter, Luisa, graduated from PS90 and attended the summer day camp program at PS99. We had a collie named Duchess; anyone who lived in the area from 1975 to 1979 would remember Duchess - we were always walking her on Metropolitan Avenue or taking her to Forest Park. I recall an art studio on Lefferts Boulevard. The artist lived upstairs. The subject matter of his paintings has stayed in my mind for years; his paintings were fantasy-like, many of them containing serpents; the colors were quite striking. Does anyone recall the artist’s name? While I have seen the Richmond Hill Historical site, I found yours quite by accident. I was searching for a source for Ronzoni Spinach Pastina. One of the results was Brooklyn Stoop, which offered recipes and NY nostalgia links. From there I found your site. It’s amazing what memories one click of the mouse can uncover. Thank you. Great site -- keep up the good work. Speaking of food, I've acquired a copy of an old recipe book published in 1934 by the First Church of Kew Gardens. I am soon going to start publishing those recipes here so you will not have to look elsewhere for suggestions on fine dining. Move over, Emeril. I was both surprised and saddened to learn that Simonson's Funeral Home -- a stately landmark across from the Richmond Hill Library -- has been bought by a developer. Who knows what will arise in its place? Maybe another apartment building. My mother lived beyond t her 101st birthday. Seventy or so of those years were spent in Kew Gardens. During the last of them, she attended a number of funerals at Simonson's, a family owned business. She was particularly impressed with the personal care taken by John and other staff members. In one case, they were able to cut through the red tape to see that a woman who had little means could be accorded a decent funeral. Two years ago, when the time came, my brother and I made arrangements with Simonson's -- and we have not regretted that decision. I don't mean for this to sound like a commercial endorsement. It's more than that. It's a sense of appreciation for the so-called Mom 'n Pop enterprises in America, which -- from the cradle to the grave -- can often perform the job better, treat its clients with greater care, and price its services competitively. Before making a commitment, I did some comparative shopping. And here is something surprising I found: most of the large "chain" funeral homes that advertise as being affiliated with one or another religion are actually owned by big outfits in Texas and elsewhere. The "owners" are not necessarily of the same religion as the funeral home advertises -- so one is not "supporting one's faith" by making that choice. Smaller, non-sectarian homes offer services and rituals for all faiths for less money, and are usually a more intrinsic and civic-minded part of a community. The "little" businesses were always part of what made Kew Gardens and Richmond Hills unique. What "corner" of the market will the developers be going for next? Editor's Note: The local Queens Tribune newspaper has an article (see link below) about the 2Pm Sunday, March 12th demonstration in front of the Republican Club on Richmond Hill for community preservation. The problem is one all communities face - Kew Gardens no less than Richmond Hill. Please be there if at all possible to show your support. Simonson's Funeral Home on Lefferts Boulevard at Hillside Avenue has been sold to a developer. We are concerned as to what will happen to Simonson's. This is part of our proposed historic district for downtown Richmond Hill. To lose this magnificent structure would be horrendous! We are having a protest on March 12th at 2:00 PM to bring out all of the community to protest the Landmark Preservation Commission's lack of attention in these matters. It will be in front of the Republican Club on Lefferts Boulevard one half block south of Hillside Avenue. The press has been invited. Bring posters. Please mark this date on your calendar and PLEASE GET INVOLVED!!!!! I was born in Kew Gardens in 1943 (in the K.G. hospital). My family lived in the Arden Terrace until I was 4 y/o. Then my parents bought a house on Abingdon Road near Lefferts Blvd. Abingdon Rd. was a great hill to ride your bike down. I remember a woman we called "the mean old lady" lived in the corner house (Lefferts & Abingdon). I guess kids dropped candy wrappers on the sidewalk and she used to yell out of her window to pick them up. Across Abingdon Rd. from the "mean old lady" was a family who had two children. Their names were Brother and Sister. Does anyone else remember the man at the Austin theater who collected your ticket when you entered? He looked exactly like Alfred Hitchcock! My friend Marilyn (Ackerman)Suzan and I cracked up every time we went to the movies. I think I saw The Red Shoes with Moira Shearer there. My mother still lives in the same house I grew up in. She is 93.When ever I visit I am amazed at the number of foreign language newspapers near the subway and the many languages I hear on the K10 bus. It ain't old kew gardens any more! Editor's Note: I have already emailed Helen with the name, address and telephone number for Dani's House of Pizza. I've been looking at Forgotten NY. A really great site. I love those signs. Infact, a book that I didn't write - picture book, bathroom book - was of NY signs. My daily commute by car took me through East New York & Eastern Pkwy, plus countless shortcuts through Queens and Brooklyn. Also, we loved to walk around in the City. I never did take the pictures, but I've still got clear images in my head. Some of my favorites. On Eastern Pky Extension there really is, or was, a store front sign that reads "New & Used Antiques". On the west side of 9th Ave, about 48th st. the top of a store front sign states "Open 25 Hours". When you think about it, what does that really mean? For the engineers at any rate, there was a wonderful oxymoronic effort in East NY. Painted on the side of an entire building was a sign for a vacuum industrial & boiler cleaning service whicle stated in part "High Pressure Vacuum". Finally, in a really tough area in Brooklyn, on a junk yard's chain link and razor wire fence, was a hand painted warning sign that said it all in just two words: "Bad Dog". You knew, really knew that you never wanted to meet that dog. Since I'm not nominated for an award tonight I'm sitting at the computer wondering who to bother! Oh, I do see all the limos whizzing by on their way to Hollywood though! But enough of that nonsense - Could someone 'zero in' on the name above the word 'Luncheonette' in the 'Kent' picture (I can't make it out at all)? I ask because I have an idea that soon after this picture was taken all of the stores were displaced by the Bohack market. It may be that this luncheonette moved and became 'Levin's' (which then became Kew Cozy), or it may have been the original store of the Lucas's (which, in my memory, was nearly at the corner of Beverly and Lefferts on the Kew Corners alley side), and finally it could have moved almost directly across to the east end of the actual Ponte Vecchio with a name that I woudn't possibly remember. My problem is that I was only two years old when this photo was taken in '41' and have little memory of the time frame. Hope someone out there can fill in the blanks. Editor's Note: Al, if I enlarge it as much as I can, the second word is definitely "SHOP" The first word might be "GOODY", but it's really hard to tell. Great frontal shot of the Kent Cleaners store (Jay Rogers was correct when he said that the Kent signs were bright orange with black lettering). I also notice very clearly a 'Railway Express' truck parked in front. It might have been summer camp time because they always picked up our trunks and duffle bags! The luncheonette next to Kent is a real mystery to me! In the picture of the 'Kew Cozy' in the 'Find It' page it appears, from the help wanted sign in the window, that Carl was looking to replace his long time waitress Harriet (I can still hear her yelling her orders across the room). I have attached a picture of me, which I believe was taken in 1953 with the Kent Manor- Hampton House in the background. I'll leave it up to you to confirm the background. I blocked out the face of the person next to me, as I don't feel i have the right to send a picture with another persons image in it,regardless of how long ago it was taken. Editor's Note: Yesterday's New York Daily News newspaper had a special piece about a web site named "Forgotten New York" run by a guy named Kevin Walsh. If you have never visited his site, you're missing out. It is absolutely outstanding. The man is a master at unearthing fascinating historical trivia in and around New York City. The following links will open in new windows. Close out those windows to return here. I lived in KG from 1957 until 1971 at 83-19 116 street. My father was the building superintendent in the building. My friends included Michael Kassinove, Michael Dasher, Joel Goldberg from the building. Also, Lenny Fox, Josh Wolf, Ralph Wachs and Bob Milano. I attended P.S. 90 and then Richmond Hill High School where I spent much to much time in athletics, singing groups and hanging out and not nearly enough time on academics. I was a member of the Keg Rats with Cozzy, Diane Merchant, Head and many others. I now live in Manhattan and am one of the Registrar’s in the City University. I miss ‘Ol KG very much, it’s wonderful tree lined streets, my good friends, Forest Park, Overlook, Dani’s Pizza Place, The Rail Road Station and all of it’s tiny stores and the Village atmosphere ... .
I’m the sleepy eyed blond guy in the pic looking down at the ground. If the Kent Cleaner sign was Orange & Black then I remember it. 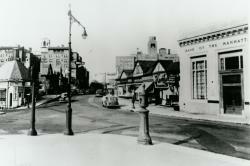 Something interesting about the 1941 picture of Lefferts from 83rd. It appears as though there was a 'Kent' cleaner before Bohack next to the bank. Kent was a very large franchise with stores throughout New York. Something I didn't know!! (or have no memory of). Editor's Note: Al, you are correct. Click here for a better c. 1941 view. I HAVE SO MANY PASSWORDS, IDs,PINS, AND ACCESS CODES I CAN HARDLY REMEMBER MY REAL NAME, I THINK I AM LENNY SCHNEIR WHO GRADUATED PS99 IN 1954 AND WOULD LOVE TO HEAR FROM MY CLASSMATES AND OLD FRIENDS. I am in agreement with Doris O’Brien who, in her February 27th. Guest Book letter, takes offense at an earlier correspondence by Miriam Haringman in which suggestions are made that Kew Gardens was a ‘restricted’ community until WWII. It is true that, as modern Kew Gardens began to take shape during the second decade of the twentieth century, overtones of anti-Semitism did abound. And, in fact, were even discernible between the lines in New York Times real estate offerings of the day. However, most of that atmosphere had already dissipated by the beginning of the thirties. Certainly, my parents, who were drawn to the village by both its charm and close friends who had already settled there, would never have invested in property and built their home on 83rd. Avenue in 1937 if they had even thought that they would have been unwelcome in the area! The first temporary facility of the original Kew Gardens Jewish Center had been long established at 124th. St. and Metropolitan Avenue, and much of the apartment housing in town was built and operated by Jewish developers from Manhattan! Finally, the likes of Sam Levine, who opened his ‘Garden Hardware’ in the then new Kew Corners building on Lefferts in 1923, would never have succeeded had he been ostracized by an anti-Semitic customer base! On a related subject, Ms. Haringman’s referenced letter also talks of pro Nazi activity in Kew Gardens. While I cannot reveal any specifics due to the fear of legal reprisal, I will say that there was one prominent storeowner on the boulevard who was alleged to have been a member of the German/American Nazi party! Joe, here are a few photos that my Mom gave to me. The infamous large house on Park Lane South is where we are sitting on the steps with my brother Danny and my Dad. One of the two photos in Forest Park near by the riding trail - take a close look where my brother's head is turned from the camera -- it surprised me too - the four gentlemen on horseback! The date on these photos is December 1953.